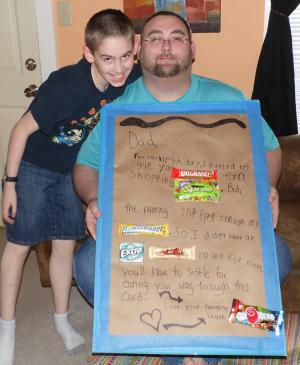 Homemade birthday gifts are a thoughtful way for kids to show Dad how much they appreciate everything he does. With a little adult assistance, even preschoolers can actively participate in creating DIY presents for their fathers. A personalized magnet (pictured above) is a simple gift that younger kids can easily make with minimal adult assistance. 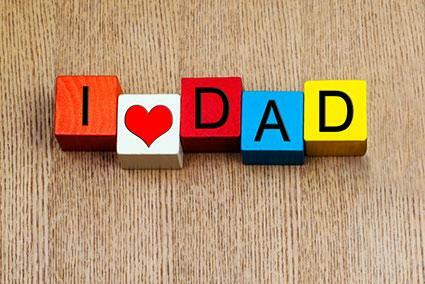 Arrange the blocks to spell a message such as "I Love Dad" or "Dad Rules." Join the blocks together with wood glue. When the glue is dry, add the self-adhesive magnets to the back of the project. Use one magnet per block so that the finished project isn't too heavy for the magnets to be effective. 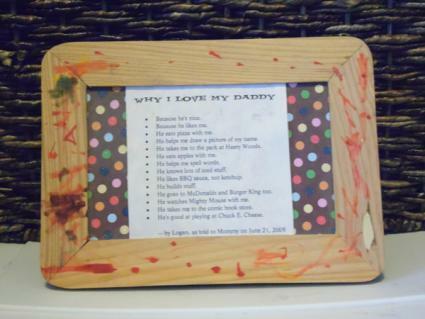 A framed list of reasons why your child loves his or her father makes a special keepsake. Mount the printed list on a sheet of decorative scrapbook paper, adding a photo of your child with his or her father if desired. Add the list to the decorated frame. Show him how much he's appreciated with a custom-designed trophy. This project uses recyclable materials and is ideal for preschoolers. Glue the bottoms of two white paper cups together, with the opening of the first cup flat on the table and the opening of the second cup forming the top of your trophy. Add a strip of washi tape around the bottom cup. Use yellow construction paper to make handles for the trophy, attaching the handles with a small amount of glue. 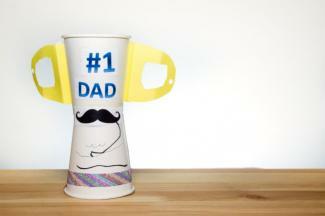 Use markers and/or letter stickers to write "#1 Dad" and add any other desired embellishments. 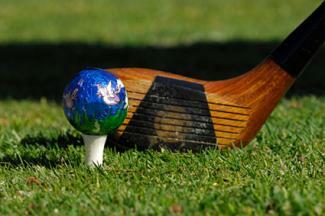 If Dad loves to golf, kids can create personalized golf balls for him to use at his favorite course. Draw designs on golf balls with Sharpie markers. Try to keep the designs fairly simple, using geometric shapes or patterns like stripes and polka dots. If desired, add the child's name and/or the year to the work of art. 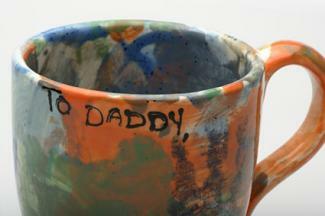 Most communities have paint-your-own pottery shops where kids can go to decorate a mug as a birthday gift for Dad. However, it's not too difficult to complete this type of project at home. Mug painting also works well for children of all ages since kids can paint progressively more complex designs as they get older. Paint your desired design on the mug. Use the acrylic paint markers for fine detail work or to write a message on the mug if desired. Let the mug dry for at least 24 hours. Then set the paint by baking the mug at 325 degrees for 45 minutes. Turn off the oven and wait for the mug to cool completely before removing it. If Dad works in an office, a terrarium is a thoughtful homemade birthday gift that can be used to decorate his workspace. All a terrarium needs to thrive is a healthy amount of indirect light, so it's much easier to maintain than a standard potted plant. Using your funnel, place a thin layer of decorative rocks at the bottom to act as drainage for the plants. If desired, you can combine rocks with colored aquarium gravel. Add a small amount of charcoal soil conditioner over the rocks. This helps absorb excess moisture, which prevents mold growth. Add a generous amount of potting soil. Add the plants, making sure the roots are covered by the soil. Use the kitchen tongs if needed to position the plants. Add any desired decorative accessories. Use the kitchen tongs if needed to arrange your items. 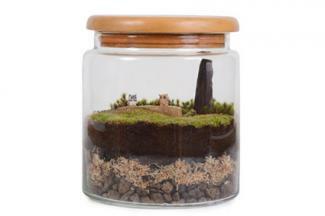 Lightly water the soil, then loosely close the lid to finish your terrarium. 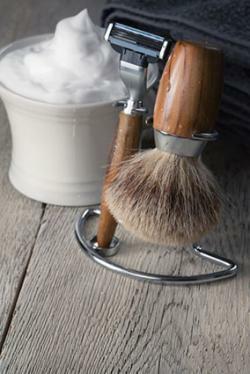 Homemade shaving cream is a useful birthday gift for a man who appreciates a close shave. This project is a good one for tweens and teens to make for Dad since it requires the use of a stove and mixer as well as the ability to measure ingredients accurately. Melt the shea butter and coconut oil in a saucepan over low heat, stirring well. Remove from stove and transfer to a heat-safe mixing bowl. Add jojoba oil, stirring well. Add essential oils if desired. Peppermint and/or rosemary essential oil would work well for this recipe, but you can feel free to customize the fragrance to suit Dad's personal tastes. Use 10-15 drops of essential oil in total. Chill the mixture in the refrigerator until solid. Remove the mixture from the refrigerator and whip with a mixer until it's light and fluffy. Spoon the finished shaving cream into a decorative jar or other container with a tight-fitting lid. A creative photography project is a fun birthday gift for older children to make for Dad. 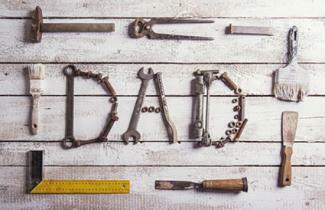 Arrange items that represent Dad's hobbies or interests to spell "DAD." This example uses tools from the garage, but you could use pencils, pens, and other supplies for a father who works in an office, toy cars for a father who is passionate about automobiles, or golf tees and golf balls for a father who loves to golf. Encourage your children to be creative with their choices. Take a clear, in-focus photo of your still life. Print the image at home on photo paper or use an online service to purchase a copy. Add the printed photo to the frame of your choice. If you're looking for a gift that multiple children can make together, this handprint canvas is a lovely work of art that Dad will be proud to display. Spread newspaper on your work surface. Paint the canvas the desired background color using acrylic paint. 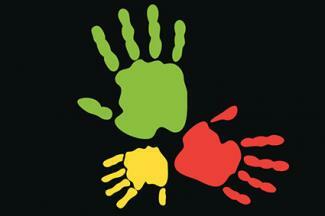 When the background color is dry, have each child add their handprint to the canvas. Start with the oldest child's handprint in the upper left hand corner. The handprints should form a circle when you are done. If desired, add names and a date to your finished artwork with paint markers. Have fun creating a birthday card that Dad can eat. He's sure to love this oversized card accented with a wide range of sweet treats. Have your child write the following message on the posterboard or cardboard, leaving spaces to attach the appropriate candy with a hot glue gun. You can also get creative and make your own fun message using candy to replace some of the words. For your birthday, I wanted to give you [100 GRAND CANDY BAR] for a shopping [SPREE CANDY]. But, the money slipped through my [BUTTERFINGER CANDY BAR]. So, since I didn't have an [EXTRA GUM] [WHATCHAMACALLIT CANDY BAR] to sell for more, you'll have to settle for eating your way through this card. Making a homemade gift is a special way to show someone how much you care. When kids create homemade gifts for their loved ones, they learn creativity as well as the importance of being generous and considerate of others.